Recently, many words refering to the economic development and/or environmentally commited notions are invented and used in an arbitrary manner; also, numerous definitions related to important terms, which, presumably, should be carefully defined, in fact have no practical significance, due to the words with fuzzy sense, or to the contradicting statements participating in them. Definitions examples given in the paper are the reason for a strict principle acceptance in the publications of the Association of Bulgarian Environmentalists and Ecologists - ABEECOL. According that principle, a real contemporary definition should not include fuzzy adverbs or fuzzy adjective and should give quantitative knowledge, quantitative discerning criteria about the term defined. Even a single fuzzy notion attending the determinating sentence can discredit, from our point of view, every definition although carefully composed. Shortly, a real definition should possess the clearity and synonimity of the recognized patent claims. There are too many definitions about the notion "sustainable development" (SD), but almost all of them, including those of Brundtland Commission and of Agenda 21 (Rio, 1992) can not pretend to have clear and universally applicable practical sense; they are just mottos and slogans. According to the notion of the Thermodynamics of Accumulation Processes (TAP) a stationary or developing system could be stationary one, in a most general sense, on condition that the quantitative alterations of its free thermodynamic potential and of its bound energy remain internally balanced . A very important conclusion follows from that notion of TAP: a simultaneous continuous, much less sustainable development of all subsystems can not be realized in a system with space and resource restrictions. Unfortunately, that conclusion for regions, countries are even for the civilian societies of countries, considered as such "restricted systems", is, inevitably, valid. Some of the subsystems can develop, even sustainably, but solely on account of other, degenerating subsystems. The only possible way towards a common sustainable development of all subsystems can not be some temporary "fair resource distribution" among the subsystems, but the continuous, or even accelerated broadening of the resources; that is achievable on the base of inner moving forces, caused and supported by potential inequality between the subsystems. a. The sustainable development is only one of the possible (desired or forced) development kinds and, can not be universally preferable and practically applicable. b. Each development kind should be prefered only if its optimum effectiveness is proven by quantitative juxtaposable assessments. c. A simultaneous equal positive sustainable development of all subsystems included in a system with restricted resources and expansion space is impossible. That precondition is not only easily understandable, like the previous both ones, but also is a direct consequence of the analogy with the proven rule that, a simultaneous equal evolution of all subsystems included in a biosystem can not be realized if there are restrictions regarding expansion area and resources. Thus, "the sustainable development of a region, country, town, enterprise, etc., during a certain time-period t, is the totality of their state changing process effects, expressed by the increase (or decrease, or constancy at least) of the values of economic-social-environmental factors (criteria), recognized by the majority of the respective citizens as favourable (or unfavourable, respectively) ones, if the value changes are not less than 0.1% and not bigger than 2.5% compared with the same factor values for the previous t-period; that alteration value should be restorable after the removal of some harmful influence in a time course less than that of influence duration". 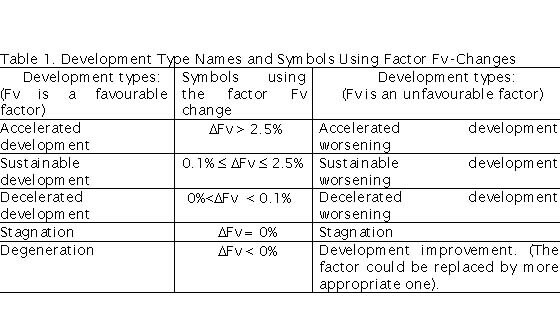 If Fv is, e.g., such a criterion, we discern the development kinds and their symbols as presented in Table 1. Minimum change of the factor values - 0.1 per cent - accepted in the definition, corresponds to one hundreth part of the round-off error (0.1) recently usable in the factor values generalized presentations . On the other hand, the maximum percentage change of the factor values accepted - 2.5% correspond to percentage, the absolute value of which increases with no more than total 10% in the course of the following 5 years, in order that change to be preserved constant regarding the value of the factor, continuously enlarged with the time. where a and b are the respective significance coefficients of EcED and EzED; they express: a- the relative economic importance of the human health and of agriculture; b - that of the industry; a+b=1; a and b-values are calculated by mathematical expressions or are based on expert opinions, as well as on expert system estimations. For Bulgaria, e.g., a=0.667; b=1 - a = 0.333. 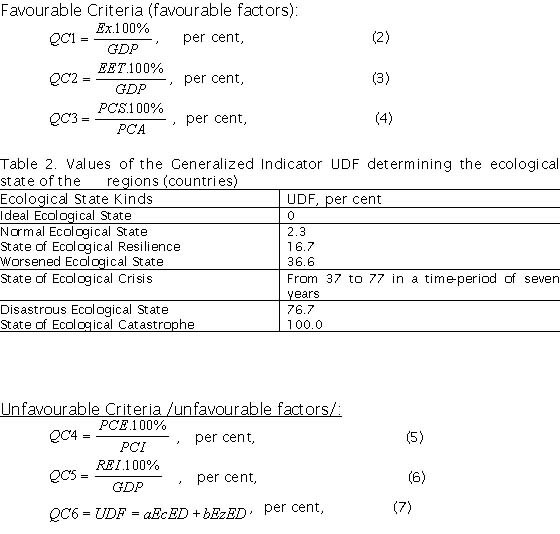 For example, we can propose the following six Quantitative sustainable development Criteria, QCI - QC6. Thus, a contemporary clear and practically applicable definition of the notion "sustainable development" can be build, in accordance with the principle and approaches of the Bulgarian Association of Environmentalists and Ecologists - ABEECOL. However, the Fv-factors can be various, respecting the state and the necessities of each country and even country regions and towns. 4. State of the World 1995 - A Worldwatch Institute Report on Progress Toward a Sustainable Society. W.W. Norton & Company, N.Y.- London. Tables 1.1, 1.2, 8.1, 9.6.